Australia's great ideas and vision can be seen by the many inventions that originated in Melbourne that have helped improve the lives of people all over the world. From medical (headache tablets) to Vegemite, our wonderful savoury spread, Melbourne is responsible for all kinds of things. For more information about each invention, see links at the bottom of this page. George Richard R. Nicholas made the first Australian acetylsalicylic acid (aspirin) in a tablet form registered in 1917 as "Aspro". 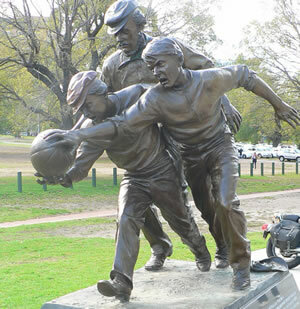 Tom Wills is widely credited with devising Australian rules in Melbourne in 1858 described as a mixture of soccer and rugby and also bears some resemblance to Gaelic football. Image above. Henry Chapman brought in the ballot system of secret voting, afterwards known as the Australian system and adopted by countries all over the world. The Australian Bionic Ear is the result of pioneering research commenced by Professor Graeme Clark in the late 1960s at the University of Melbourne Department of Otolaryngology. The Dim Sim was developed in Melbourne by Chinese chef William Wing Young for his restaurant "Wing Lee". The 150th anniversary of the Eight Hour Day in 2006 marked the action taken by stonemasons on 21 April 1856 led to the establishment and maintenance of the Eight Hour Day, recognised internationally as a world first. The invention of the first electric drill is credited to Arthur James Arnot and William Blanch Brain in 1889 at Melbourne. The electrical drill was patented by Mr. Arthur James Arnot in 1889. Regarded as the world's first feature length film, the 70 minute length The Story of the Kelly Gang was unprecedented when it was released in 1906. The film cost an estimated $2,250 and was filmed in St Kilda, Eltham, Greensborough, Heidelberg, Melbourne, Mitcham and Rosanna. Around 1912, an inventor in Geelong called Gilbert Toyne, designed a rotary clothes hoist. By the early 1920s, Toyne's 'All-Metal Rotary Clothes Hoist' was being manufactured and advertised in Australia - about 25 years before the first 'Hills Hoist' which was the first to attach a handle to raise and lower the hoist. Also see Melbourne History on the Line for a photograph of a rotary clothes line taken in 1873, 73 years 'before' the Hills hoist developed by Lance Hill. James Harrison began operation of a mechanical Ice-Making Machine in 1851 on the banks of the Barwon River at Rocky Point in Geelong. His first commercial ice-making machine followed in 1854 and his patent for an ether liquid-vapour compression refrigeration system was granted in 1855. Harrison introduced commercial vapor-compression refrigeration to breweries and meat packing houses, and by 1861 a dozen of his systems were in operation. An aircraft approach and landing guidance system using microwaves was successfully tested at Tullamarine Airport, Melbourne. Kiwi is the brand name of a shoe polish, invented by William Ramsay and Hamilton McKellan in a small factory in Melbourne. Why Kiwi for a name, it was named William's New Zealand born wife. The Ansell company had made household gloves since 1925 but in 1964 they introduced the disposable latex gloves for use in surgery. Milan Hudecek of Melbourne invented the world's first reading machine for the blind. Heralded as the world's first influenza drug Zanamivir was discovered in 1989 by scientists led by Mark von Itzstein at the Victorian College of Pharmacy, Monash University in collaboration with the CSIRO*. Angelo Di Pietro from Melbourne designed and built the Di Pietro Motor (Rotary Air Engine), the world's first commercially-viable motor vehicle that runs on compressed air and drives a rotary engine. Engineair, the company that Angelo works for, says their invention produces absolutely no pollutants and is extremely efficient having only two moving parts. * In 2010 we asked Angelo for a date of invention. In short there isn't a date, because he was still perfecting his air engine. It was also clear, Angelo is a pure gentleman with drive and tenacity to realise his dreams! Qantas inaugurated a pioneering round-the-world airline service with two planes taking off from Melbourne. The combine harvester pulled by horse or mule teams was invented in the United States by Hiram Moore in 1834. In 1882, the Australian Hugh Victor McKay (Drummartin, Victoria) developed the first commercial combine harvester in 1885, the Sunshine Harvester. The suburb of Sunshine was named after Sunshine Harvester where it was manufactured. Telephane was the forerunner of the television invented by Henry Sutton in Ballarat, 3 years before the 'birth' of Scotsman John Logie Baird, who made use of Sutton's patent. Sutton devised the telephane to transmit the running of the Melbourne Cup horse-race in Melbourne to the town of Ballarat. It did not have a screen, and the viewer had to look into a hole at the end of a long tube with a signal transferred by telegraph line. George Lewin invented the Triton Work Bench in his Melbourne backyard shed - almost by accident. Trugo like Australian Rules Football is one of Australia's few indigenous sports. While Aussie rules football has become a national sport, Trugo is only played in Victoria. It is still played in the suburbs every week (2016) and apart from it's players, most people have never heard of it. A ute is a motor vehicle with the cabin of a car and the rear of a small truck popular with a Australian farmers and tradesmen. James Freeland Leacock invented and built the first ute in 1929. The application to register a convertible body for motor vehicles was submitted to the Patents Office on behalf of inventor James Freeland Leacock, and accepted in 1930. Leacock's invention pre-dated the launch of the first official Australian 'ute' by five years. The first commercially produced Ute was sold in 1934 by Ford and designed by Lewis Brandt at the Ford Motor Company in Geelong, Victoria. Every jar of Vegemite 'ever made' has come from the Melbourne factory at Fisherman Bend. Fred Walker and Cyril Callister developed a spread from one of the richest known natural sources of the vitamin B group - Brewers Yeast. A global drive architecture for rear wheel drive vehicles, was developed by a Melbourne engineering team led by Tony Hyde. It is expected to be used in all GM rear wheel drive vehicles produced throughout the world. We can't talk about inventions without mentioning our amazing team at the CSIRO | Commonwealth Scientific and Industrial Research Organisation. CSIRO inventions range from household products like Aerogard and Softly to everyday necessities like plastic bank notes and WiFi. Many developed right here in Melbourne (Clayton). Let Derek Guille take you on an exploration of Melbourne's culinary hotspots as Eat, Drink Melbourne takes in the story of Australian food icons like Vegemite, the Freddo Frog, and the Dim Sim which were all invented in Melbourne. See if you can identify who was responsible for a number of Melbourne world firsts. Q: Which feature of McDonalds was the first to appear in Melbourne in 1992? A: > Alcoholic beverages > Free fries > McCafe > Table service? Q: In 1967 what 'walk through' zoo enclosure was the first of its type in the world? A: > the lion enclosure > the walk through aviary > the butterfly house > the nocturnal house? Q: The expression 'call girl' for a prostitute was invented in Melbourne. A: Which bank did Dr Lucy Bryce pioneer in 1926? Q: > agrarian bank > blood bank > trust fund for single mothers > savings bank? Q: What appeared on the tram tracks in 1983 becoming the first of its kind in the world?